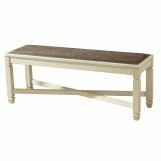 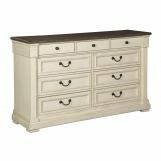 Made with Acacia veneers and solids finished in a trendy textured antique white color. 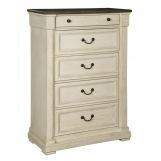 Dovetailed drawers feature fully finished drawer boxes and metal ball bearing side glides. 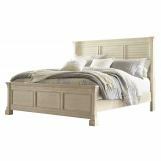 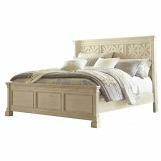 Shelter styled panel headboard has lattice design headboard panel and a louvered headboard panel. 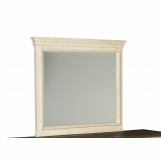 Cases feature framed drawer fronts, break-front pilasters and profiled base mouldings for added dimension. 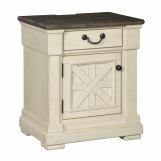 An accent night table features door cabinet storage with an AC power supply and USB charging ports for powered devices.